Teresa Danks: As a teacher in Oklahoma, I've literally panhandled for school supplies. No wonder we're walking out. Teresa Danks As a teacher in Oklahoma, I've literally panhandled for school supplies. No wonder we're walking out. The public stands behind teachers but politicians continue to stonewall us. So we’ve taken matters into our own hands. On April 2, many of my fellow public school teachers across Oklahoma — as well as all of the public school teachers in Kentucky — walked out of state's schools to protest our insultingly low pay. 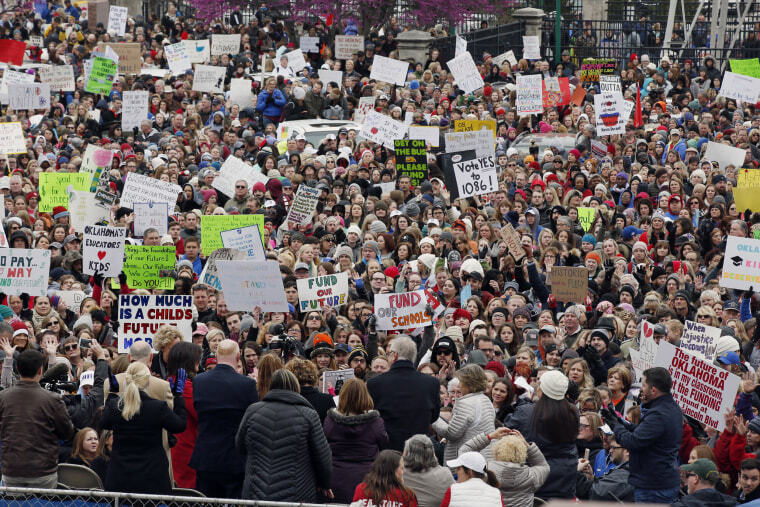 Following in the footsteps of teachers in West Virginia, educators across the country are standing up for their rights and the rights of their students. This is a national issue that has flown under the public radar for far too long. I should know. Teachers in my state haven’t had a state pay raise in a decade. This, coupled with a multi-million dollar cut to the Tulsa public school district’s budget last year prompted me to literally stand on the side of the highway, begging passing motorists for donations. I never thought it would come to this; I never thought when I first became a teacher that I would literally be forced to panhandle for school supplies. But I was tired of not having enough money for my classroom, of being expected to always use my limited cash reserves to pay to enrich my curriculum. In Oklahoma, money was so tight in 2017 that some school districts started cancelling Friday classes. My experience panhandling — and the foundation that I founded, Begging for Education, as a result — proved something important to me: The public stands behind teachers. And yet, politicians continue to stonewall us. This is why we’ve taken matters into our own hands. If ever there was an issue that should unite us as a nation, it is the education of our children. Research proves that an educated nation is a better nation. A well-educated child is more likely to graduate, find a good job and become a productive, revenue-earning and tax-paying member of the state and communities in which they live. Put simply, the lack of funding and poor fiscal responsibility in Oklahoma and across the country is setting our children up for failure. And while we’ve stayed silent for years, teachers are simply not going to keep allowing politicians to get away with it. On March 29, Oklahoma’s governor signed HB1010XX, a $447 million tax increase that would fund an average $6,000 pay increase for teachers, money for support staff, state employees and textbooks. But this is not enough. It’s been decades since the last state-wide school shut down, and today we find ourselves once again forced to act. And we're not going to go back into the classroom until we feel confident that the changes are real, and will make an impact. This inequality starts at the top and eventually trickles all the way down to our students. The public education system continues to be extremely top heavy with people making six figures in the highest administrator jobs, being paid huge sums to unnecessarily micromanage college-educated teachers. Oklahoma can no longer recruit new teachers or retain our current teachers and many are close to retirement. This crisis is quickly turning into a tragedy. Meanwhile, as of 2016, “the average annual pay of Oklahoma’s elementary, middle school and high school teachers all ranked last among the 50 states,” according to Politifact. Indeed, after 25 years, and with a Doctorate degree, an educator in the state of Oklahoma are only guaranteed a salary of $46,000 under the current state salary scale. Every local school district in Oklahoma has the authority to implement their own salary scale but many, instead, choose to use the state minimum salary. Local school boards can also increase salaries for educators without state involvement but most do not. Fiscal responsibility and transparency by our superintendents, districts and legislators in Oklahoma is required if we are going to fix this problem in the long term. This is about much more than a salary dispute. Oklahoma can no longer recruit new teachers or retain our current teachers and many are close to retirement. This crisis is quickly turning into a tragedy. By forcing teachers to pay for students’ supplemental games, activities, art and musical supplies, the state has taken away our ability to be creative. We are being forced to teach to test scores. Teachers chose education as a profession, not a hobby. And if we do not fully and realistically invest in them, our children will pay the price. Today’s state-wide walkout has been weeks in the making. The Oklahoma Education decided, unilaterally, that educators should get a $10,000 raise, spread out over three years. Even this meager demand was not met by state legislators. But in reality, a $10,000 raise is needed immediately. And without this immediate increase in compensation, educators in the state of Oklahoma will continue to change careers, leave for other states and/or retire earlier than planned. And we also need to change annual raises so that they take into account inflation, rising benefit costs and help prevent teachers fleeing to neighboring states. Teresa Danks is a third-grade public school teacher in Tulsa, Oklahoma and the founder of the Begging for Education foundation.